There are those that believe that the desire to utilize BIM is outpacing technology. The REAL issue is that many Owners, Contractors, AE’s, BPMs (business product manufactures), and oversight groups are being outpaced due to their lack of understanding of “basic” BIM PROCESSES. BIM is NOT 3-D rendering or collision detection. Tools like Revit, ArchiCAD, Bentely, et al, are only components of a total BIM solution. BIM is a PROCESS, combined and integrated with supporting TECHNOLOGY(IES) to enable life-cycle management of the built environment. Efficient Construction Delivery Methods and Software: ( IPD – Integrated Project Delivery, JOC – Job Order Contracting, JOC is IPD specifically for repair, renovation, sustainability and new construction; whereas IPD is for major new construction). Capital Planning and Management Systems-CPMS: Facility condition assessment, multi-year capital planning scenario analysis. Space Planning – CAFM: Utilization, hoteling. Computerized Maintenance Management Systems – CMMS: Routine/preventitive maintenance of “moveable” equipment (typically under $5,000-$10,000, vs. capital issues. Building Automation Systems – BAS: Automated HVAC, Security, Energy monitoring and control systems. Geographic Information Systems – GIS: Physical location systems. A single “BIM” system will not support the above, and likely will not for a long time. Technology is not the limiting factor relative to BIM, however, a thorough understanding of the basic concepts, components, and processes associated with BIM, and gaining the appropriate level of competency within each domain, is certainly a challenge. Equally daunting is gaining the associated requisite support of upper management within the Owner, Contractor, AE and other communities. Achieving and sustaining energy savings depends on advances in energy management (EM)–for example, the ability to exploit occupancy, energy prices, and weather trends when optimizing building system performance. Reducing the computational complexity of building-wide EM systems will make them more desirable. Working with BuildingIQ, an Australian building automation start-up firm, Argonne is developing a proactive EM system to address these challenges. While building operations are inherently dynamic, with changes occurring quickly in external conditions, building systems respond slowly to these changes and provide an opportunity to optimize energy use, occupant comfort, and system responsiveness. To capture that opportunity, Argonne’s system will use adaptive building-wide predictive models that account for zone topology, energy and mass balances, HVAC systems, real-time occupancy, energy prices, and weather forecast information. EM systems rely on iterative solutions of complex optimization problems, which need to be solved quickly and reliably to ensure appropriate real-time performance. Fast optimization algorithms also enable implementation with inexpensive, commodity hardware, thereby enabling widespread deployment. The research team is leveraging Argonne’s expertise in numerical optimization to deploy state-of-the-art and open-source optimization functionality and developing model reformulations and warm-starting strategies. These capabilities will enable set-point updates in a few minutes for large and highly detailed building models and long forecast horizons, enhancing system responsiveness and robustness. The algorithms are being implemented in BuildingIQ’s system, which uses building models constructed automatically from sensor data and machine learning techniques. This approach avoids the need for expensive model development tasks and simulation engines that limit deployment. A proactive EM system is currently in use in the Theory and Computational Science Building on the Argonne campus. A new generation of occupancy sensors, developed by global technology innovator Johnson Controls, will be field-tested as part of this demonstration project. Argonne and BuildingIQ will add new data mining capabilities to allow for association of occupancy patterns with building zones or other items of interest, while maintaining confidentiality of occupant identities. This project is being funded by U.S. Department of Energy’s Building Technologies Program. By now, it should be apparent that construction costs for a high performance building are not significantly high than “traditional” construction. True, documentation associated with LEED can increase costs, however, LEED is not required, or even recommended for everyone. That said, what about existing buildings? What project provide the highest return on investment? The true value of BIM in NOT in 3D modeling, clash detection, or providing architects and AEC firms a with a better way to “sell” new projects/buildings. The value of BIM is in INFORMATION and the associated aspects of collaboration and life-cycle building management / total cost of ownership. BIM is NOT technology alone, but a business process that is embedded within and support by technology. Autodesk, Bentley, Archicad, et al can not and do not supply BIM. They supply basic components of BIM, the 3D visualization engine and an associated database architecture … (both hopefully based upon open standards or they will be of little value). While all three would argue the point, facts are facts. There is too much domain knowledge required for life-cycle management for a single technology vendor to cover “all the bases”. It up to Owners, Contractors, AE’s, and the wide range of Consultants and Complementary Technology/Software Providers to deliver true value to BIM – space planning, capital planning, operations and maintenance, costing/cost engineering, standardized taxonomies, metrics, benchmarks, decision support, collaborative project delivery processes, etc. …. components that enable a complete BIM system. Transparent standardized information, collaboration and technology may someday enable BIM to deliver integrated construction / renovation / repair / maintenance / sustainability project delivery on a life-cycle basis. In the interim, both JOC (job order contracting) and IPD (integrated project delivery) deliver today relative to exponentially more efficient and transparent construction project delivery methods and processes. Both are superior to design-bid-build, design-build, etc. etc. Both JOC and IPD demand collaboration and both are performance based. JOC drives the project from concept/scoping through bidding, construction, warranty, and close-out. IPD currently focuses upon collaboration from project conception through start-up, however, can be easily extended. The limited view of IPD. The contractual IPD based upon various standardized IPD contracts ( IFoA – integrated form of agreement, etc). While the more important view of IPD is extension of the collaborative processes throughout the project and associated use of technology. 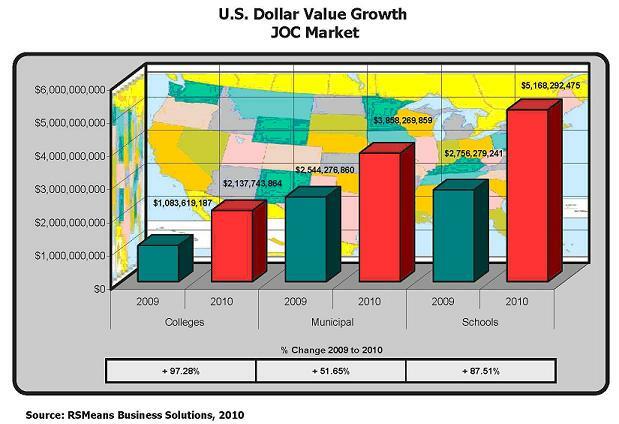 JOC already provides IPD and associated technology for renovation, repair, maintenance, and sustainability projects. It is a proven process, developed by the U.S. military years ago, however, currently, vastly improved through the use of technology such as that provided by e4Clicks (www.e4Clicks.com) and associated reference cost information (RSMeans) or other price “guides”. JOC ( also known as SABER in the Air Force ) is available today for renovation, repair, and sustainability projects and is proven to improve collaboration and quality as well as reduce costs. Paperwork costs, which average 2-3% of total project costs are mitigated using JOC cost estimating and project management software (such as e4Clicks Project Estimator), while project timelines can be reduced dramatically, providing exponential value. While the importance of BIM can not be overlooked as it will hopefully reshape the AEC industry, BIM is currently limited to 3D CAD and modest functionality, requiring the integration of third party software for CAFM, CMMS, CPMS, and JOC to reach it’s potential. Commercial and residential buildings consume about one-third of the worlds energy. In particular, buildings in Canada are responsible for 33 per cent of total energy use and for 35 per cent of the nations greenhouse gas emissions. If current trends continue, by 2025, buildings worldwide will be the largest consumers of global energy, using as much power as the transportation and industrial sectors combined. Recent studies have found that improving energy efficiency in buildings is the least costly way to reduce a large quantity of carbon emissions. By changing energy management practices and instituting technologies that enhance energy efficiency, building owners and managers can reduce energy consumption by up to 35 per cent. Today, office buildings use about 16 per cent more energy per square foot than those built 25 years ago. The total amount of energy used by commercial buildings has risen significantly since the 1980s, reflecting growth in the total amount of office space available and a massive increase in energy consumption per square foot of space. In order to achieve breakthrough improvements in energy efficiency, it is evident that a coordinated effort is required to retrofit buildings with smarter technologies. Intelligently designed buildings can save thousands and even millions of dollars in energy by delivering heating, cooling and lighting more efficiently. For these reasons, the Ottawa-based Continental Automated Buildings Association (CABA) is pleased to be working with Public Works and Government Services Canada (PWGSC) to implement a demonstration project that illustrates how energy efficiencies can be achieved by implementing new intelligent building technologies within government facilities. CABA is an international industry association, composed of about 350 corporate members, dedicated to the advancement of intelligent home and intelligent building technologies. As the federal government’s landlord, PWGSC spends an estimated annual budget of $68 million in energy costs related to the 350 Crown-owned buildings it manages. A significant priority for the government, through its Greening of Government and ecoEnergy initiatives, has been to identify methods to transform government-owned properties into technology-enabled government buildings. Working with both PWGSC’s Information Technology Services Branch and Real Property Branch, CABA has engaged a number of its members, including Cisco Systems, GridPoint and Robinson Solutions to install and integrate cutting-edge building automation systems into several of its buildings within Canada’s National Capital Region for test purposes. In simple terms, a building automation system (BAS) is a programmed, computerized network of electronic devices that are employed for control and monitoring of systems. It primarily aims at optimizing the performance, start-up and maintenance of building systems and greatly reduces the interaction of mechanical subsystems in a building. BAS is primarily used to improve energy efficiency by monitoring the temperature inside and outside buildings and controlling boilers and coolers. Essentially, they aim at optimizing energy consumption by employing a control strategy that helps building operators reduce costs, while maintaining occupancy comfort. An enhanced BAS can carry out the following functions: the optimization of start/stop of systems; the scheduling of maintenance; predictive fault detection; alarm generation and preventive actions minimizing damage in the case of emergency; and the constant monitoring of systems to detect abnormal operating conditions, in order to take corrective action and bring the system back to normalcy. Building automation systems vary in capability and functionality, but typically consist of sensors, controllers, actuators and software. Depending on whether a “human-in-loop” factor is involved, decisions are taken manually or by utilizing embedded intelligence such as decision-making algorithms. The ultimate goal behind the government’s test BAS installations is to enable a computerized, intelligent network of IP-based electronic devices that will monitor and control the mechanical and lighting systems in specific buildings and their associated energy requirements. The installations have been deployed at two facilities in the National Capital Region. The installations will be the basis of documentation, which will be used to develop and evaluate strategies that the Government of Canada will eventually use to realize an estimated 10 to 20 percent annual savings in energy costs. Intelligent building systems deployed through Government of Canada buildings will allow for constant monitoring of building systems in order to optimize energy use, while at the same time maintaining building climate within a specific range and providing lighting based on occupancy schedule. The systems will also allow for real-time, on-going monitoring of system performance and device failures and provide e-mail or text notification to building engineering staff. Additionally, intelligent building systems will provide a means and data for analysis of building performance through comparison of multiple buildings at various sites. Recent research studies conducted by CABA show that the application of intelligent building technologies reduces operating costs, thereby enhancing a building’s asset value. CABA defines an intelligent building as: “a structure that uses both technology and process to create a facility that is safe, healthy and comfortable and enables productivity and well-being for its occupants.” An intelligent building provides timely, integrated system information for its owners so that they may make intelligent decisions regarding its operation and maintenance. An intelligent building has an implicit logic that effectively evolves with changing user requirements and technology, ensuring continued and improved intelligent operation, maintenance and optimization. It exhibits key attributes of environmental sustainability to benefit present and future generations. 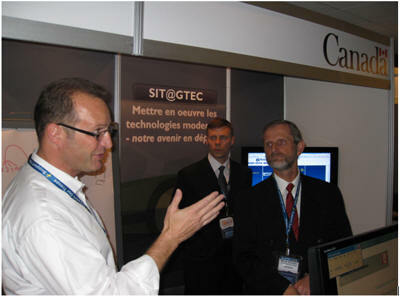 CABA members and Government of Canada employees demonstrating building control and monitoring in real-time at GTEC 2009, Canada’s Government Technology Event, in October. As part of its mandate, CABA actively promotes intelligent building technologies which enhance visibility over a building’s operational data. This can be facilitated by upgrading existing legacy systems and connecting them with building automation data and enterprise data from building systems for better control and building performance. A seamless integration is the ultimate aim of a smart building technology installation, which ultimately leads to transparency and visibility, and promotes the intelligent building concept. Large scale building owners like PWGSC typically have one of every system and protocol layer available in the market. Using a hardware and software “bridge” that can move everything to an IP enterprise network allows PWGSC to integrate its various systems and protocols into one common platform. A common enterprise network helps facilitate building systems analytics, automated fault detection and diagnostics, automated demand response, remote monitoring, predictive maintenance and renewable energy solutions implementation. Integrating intelligence is not only desirable, but is also becoming a mandatory requirement in order to obtain the best automation solutions with the simplest connections to real-time data, Web-based data and the corporate enterprise network. Open system integration provides effective overall control of a large number of buildings with remote monitoring and diagnostic capabilities. Remote access to all building systems is one of the major advantages of an intelligent building system. Advances in networking technologies and the Internet have opened the door to a network-enabled world. With device networking technology and system integration, an intelligent building can be created, allowing control over almost every system from a remote location. It can allow for predictive fault detection, reporting, timely diagnosis and prognosis capabilities for all connected buildings anywhere in the country or even the world from a centralized location. Cisco’s Network Building Mediator is an open system integration bridge device that aggregates information from all of PWGSC’s building systems undergoing testing, including lighting, heating, ventilation, air-conditioning, and temperature sensors. Building engineers and facilities personnel can control systems in any building using a Web-based interface. The Cisco Network Building Mediator can automatically adjust building systems in response to the data its collects, for example, by reducing lighting or changing temperature settings. Cisco’s device leverages GridPoint’s multi-functional building control system and Robinson Solutions’ monitoring services to optimize energy consumption, equipment use and overall HVAC load. “With the government looking to increase its office space by 4.1 million square feet in Canada’s National Capital Region over the next five years, we are extremely pleased to have had an opportunity to demonstrate concrete and immediate actions which PWGSC can take to increase efficiency of its buildings,” said Paul Hession, Director General of Real Property Technology Solutions in the Information Technology Service Branch at PWSGC. Cisco Systems, GridPoint and Robinson Solutions demonstrated their joint PWGSC building management test solution in Ottawa at GTEC 2009, Canada’s Government Technology Event in early October. This was followed by a major presentation at the 2009 Real Property Institute of Canada (RPIC) National Workshop in Gatineau, in late November, which included further demonstrations of real-time monitoring and control of test government facilities. Source via AutomatedBuildings.com Article – Research Viewpoints .